How to Secure Your WordPress Website Today (Infographic) | GUI Tricks - In Touch With Tomorrow! How to Secure Your WordPress Website Today (Infographic) - GUI Tricks - In Touch With Tomorrow! While I firmly believe that every business should have a WordPress website, it’s important to understand that, despite being the best CMS platform, our beloved WordPress can still be hacked. There are steps that every website owner should take to ensure that their content and the information they store is secured. 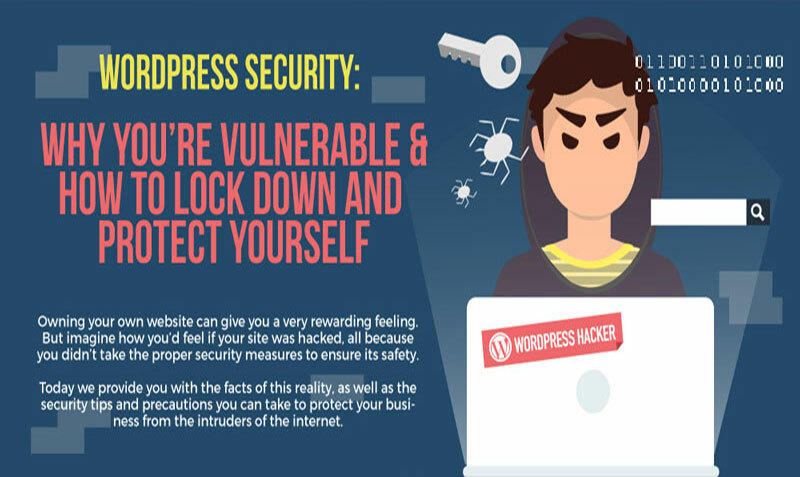 WordPress has a dedicated security team, and with the help of some simple actions on your part, and today’s infographic, you can have peace of mind knowing your site is safe. Everyone thinks their password is safe, until it isn’t. When you start a WordPress website, the default username is admin. This is widespread knowledge and if you don’t change it, then you’re making a hacker’s job easier by eliminating half of the guessing. For your username, choose something that is personal to you and not something easy to guess like the name of your business or your first and last name. The same goes for your password. Choose something that people wouldn’t normally know about you and include special characters and numbers: @, !, *, %, etc. This is another very easy one. Every time WordPress releases a new update, they include with it a bunch of different fixes for potential security leaks in their software. In some cases, you will need to manually install these updates, but they are free and absolutely worth the time and energy you’ll save by having a secure site. Next up we have an infographic from OnBlastBlog packed with plenty of tips and tricks to further harden your WordPress security. There are plenty of options available to you, so let us know how you’ve bulked up on your website’s security in the comments! This infographic is shared here after a legal permission from OnBlastBlog.